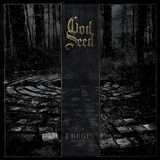 It probably is not an overestimation that black metal fans of all ilk were curious to see what the first God Seed full-length album would be like. I don't want to bill I Begin as an event of the century, but I am sure many were at least interested to hear what Gaahl and King Ov Hell could come up with when given free reins. Monumental Gorgoroth breakup behind them, Gaahl inner hiatus as well, the band was finally ready to Begin, as claimed. I have spouted earlier on these pages where I personally stand in the aforementioned breakup, and gave effusive (deserved) praise to the Gorgoroth latest Quantos Possunt ad Satanitatem Trahunt. So, even though I root for the Infernus team, I don't have any schadenfraude for the other guys. The God Seed crew didn't waste any time to kick things off. Awake plunges in right away, immediately creating dense, disturbing, apocalyptic atmosphere. The dark clouds hang over you, the oppression is palpable, this is definitely from Hell, or should I say Ov Hell. Tracks like Awake, the beginning of This from the Past and the whole of Aldranda Tre almost reminded me of Anaal Nathrakh in their powerful dissonance and avantgarde bend. Sure enough, there are still distinct melodic sweeping tremolo moments followed by the crushing section on From the Running of Blood and grim majestic feeling rules on The Wound with swaying rhythms. However, I Begin is not a re-tread of the few latter day Gorgoroth albums where King Ov Hell contributed immensely, and the band is to be commended for that. The dripping demented sadness of Lit may be a look back in a way, but even there the band injects a touch of cosmic synth and is determined to push the envelope. The mission of I Begin, in my modest opinion, was to make things complex, not straightforward, and really push that dark abyss atmosphere. Hinstu Dagar climbs the avantgarde ladder, This from the Past has interesting strange sounding effects, Aldranda Tre is an epitome of the newfound style, while Bloodline breaks into a completely experimental instrumental techno bubble with a giant contorted bass. This is the sound of madness exhaling out, reaching for the jugular. And speaking of vocals, hell must be speaking with multiple voices as Gaahl presents a number of different personas throughout the album. His hollowed out manic vocals are often the last macabre touch this music needs, but then he also has chilling spoken words over chugging riffs in Hinstu Dagar and even, dare I say it, Halfordian shrieks on Lit. Starting in tribal percussive way, but switching to almost fever pitch Alt Liv shows him off in some of the most cantankerous manner. So here I was trying to describe the album in the most unbiased way, the way I heard it, time and time again. And while it may seem I have said nothing but positive things about I Begin, I am not in love with it. Rather than being fascinated and mesmerized with the album I have a feeling of well-garnered respect for its complex and multilayered nature, but no outright tripping-over-myself fanaticism. From there things normally go two ways with me. At some point I will pick it up again. If the stars align themselves and that crucial click happens, I Begin will most likely eleveate. But if a month from now the listen just flows serenely by, God Seed will have a tough time competing with I Begin amongst my favorite black metal albums.